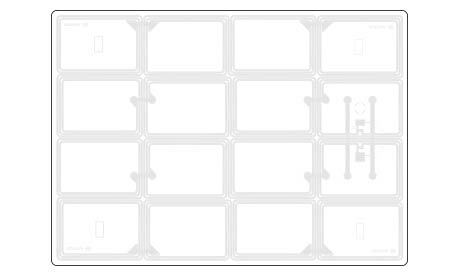 Identiv’s portfolio of 13.56 MHz RFID Inlays (HF and UHF) are completely customizable, are available as dry or wet inlays, and come in various shapes and sizes. What’s the actual data carrier in an RFID system?An inlay, of course. Consisting of an antenna and a contactless-enabled microchip, inlays are the neurons of the RFID brain. 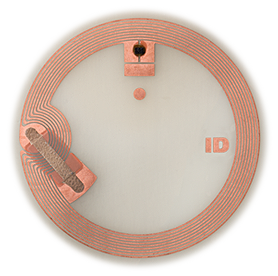 Identiv’s radio frequency identification (RFID) inlay portfolio offers up multiple designs integrating various materials, chip technologies, and frequencies for metal and non-metal environments. We produce our inlays using advanced flip-chip technology and state-of-the-art, high-volume die-bonding processes with integrated inline quality and process control to guarantee superior quality performance. Dry (chip + antenna + epoxy glue + [PET] film) or wet (adhesive backing) inlays can be directly embedded into third-party products or converted into finished products. Applications that could benefit include the Internet of Things (IoT), near field communication (NFC) smart posters and billboards, libraries, event and transportation ticketing, automotive and chemical industries, logistics and supply chain, asset management, pharmaceuticals and healthcare, device authentication and counterfeit protection, electronic games, event management, wearable technology, customer loyalty programs, and more. Identiv’s Giant NFC Transponder is a breakthrough solution, delivering consistent signal detection over the entire surface area by any NFC-enabled device through enhanced antennas. Connect an unlimited number of inlays to cover a large advertising display, panel, or wall, and every point will be completely interactive. Additionally, we offer custom designs on demand.